Every day we are given signs and omens, offered new pathways, granted new opportunities... yet sometimes we just walk right on by without noticing. And it had been that way with the great whirling dance for me. I had read a tiny bit about the dervishes and simply thought that Mevlana Rumi's turning was no more that a simple walking meditation. I figured that my meditations were just as good as his, so I never really was very curious about turning. Well... I was very wrong about what turning had in store for me. 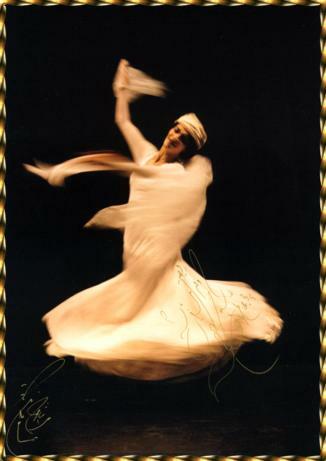 The great whirling dance really is something far beyond description. I bought the book, discovered some wonderful poetry, looked many times into the eyes of Sheikh Suleyman Loras and then set the book aside. But beginning in March 2000, the dervish path has begun to sneak up on me, at an ever quickening pace. On the weekend of March 18-19, 2000 the forces of Life conspired to get me to attend a Turning Workshop, a dhikr at Star House, a Sunday Universal Worship service and an evening of music, poetry and turning featuring Murshid Khabir Don Kitz and Rabia Karen Fehrmann. It was phenomenal. I found that I quickly felt at ease in the turning workshop. There was something natural and familiar in the turning. But even the joy of turning in the workshop did not prepare me for what was to happen during the evening dhikr. Turning at the Saturday evening dhikr was an utterly stunning experience. When Khabir started turning in the dhikr, it was breathtaking. I was ecstatic just watching him. And soon Rabia and Khabir were turning together, a symphony of silence floating around the room. Ahhhhhh. And then when I was offered a chance to turn, wow. It was a magical experience. After a little while, I realized that there was no one around me, and I began to wonder if I was out there all by myself and had missed Khabir's command to stop turning. I had no idea if I had been in rapture for ten seconds or ten minutes. The others had just tired of turning, it was just Khabir and Rabia and me and a couple of others still turning. Time didn't even make sense. I just wanted to turn. It was one of the most utterly single minded, yet amazingly expansive, things that I have ever done, and I was in the middle of a room full of people. It was not the passive ecstasy of seated meditation, it was active, dynamic, changing and ecstatic. Turning with awareness, aware of the room, aware of the people, yet simultaneously transported into a world of nothing but Allah, the focus of my turning, the center of all turning, the Center of All. Turning in the brilliance of these two worlds of Allah at once... in union with the unseen, and simultaneously in union with the all of the dancers, the singers, the building, the candles, the sounds. Amazing. Utterly amazing. There are no words. I have described the bare circumstances, but have not even begun to describe what I experienced in those moments. There are no words for that. Sunday evening there were three musicians, two poetry readers, and two dervishes. The music was provided by wooden flute, an `oud and a drum. The first reader read Hafiz in the original Farsi, and then the second read it in English. During most of the 1 1/2 hours, one or the both of the dervishes turned during the poetry reading. There was not room in Boulder's Nur Ashki Jerrahi Tekke for both to turn together, so they generally took turns turning. Khabir, was dignified, sober, and magnificent to watch. As he turned, I was transported to a very beautiful place. I could feel the history of the Mevlevi dances in every step he took. I could hear his slippers sliding across the floor, I could hear the rustle of his tennure (skirt) and I felt the breeze from it. A blur of white, with black shoes caressing the floor, a passing face, and serenity. Wow, that was magnificent. But it gets better. Then came Rabia. She was absolutely transparent. To me, she was the hollow reed that Rumi talks of. Her intoxication, the clarity of her being, the light that she became was purely angelic. Tears of joy ran down my face each time I watched her dance. Khabir brought some tears to my eyes, but as Rabia turned, intoxicated, the tears ran down my face and dripped off of my cheeks. There are no words to describe the tears. I was in pure joy. Rapture. I was in Beloved overload. Watching the turning was like being reunited with a long lost friend. Somehow, the turning was so very familiar to me. I felt the beauty of the turning, directly experiencing the ecstasy, as she turned. I felt so at home, so at peace, so satisfied as she turned. It was not merely her that I was feeling, it was the Divine Presence which she allowed to shine, to radiate forth from her. The Paris-based dance troupe Nakissa was in Boulder in July 2000, as a part of the Colorado Dance Festival. On Friday evening Shahrokh Galame and one of his dancers, Laya Torkaman, came to the Dances of Universal Peace in Boulder. It was wonderful. Laya turned to the sounds of Persian music and a woman reciting a Rumi poem in Farsi. Her dance was very interpretive, taking us from joy into sorrow and back again all while she was turning. Somehow Rabia managed to get Shahrokh and his most talented dancers, Laya, to come to our dhikr at the Jerrahi tekke in Boulder.. To get them comfortable with the way we do dhikr (which is much less intense and much shorter than they would encounter in Iran), Rabia led a couple of dhikr dances and picked three people to turn for our guests... and I was one of the ones she chose. I went into another world turning. It was exquisite. Then, she invited Shahrokh and Laya to turn... it was unbelievable. Shahrokh has been a dancer and turner since childhood and his fluidity and expressiveness were utterly astonishing. In our dhikr, he was not limited by any formal ceremonial turning. His movements while he was turning told a story (actually a Rumi poem he told us later). He took us on an adventure. There was passion and sorrow and ecstasy. It was unreal. I didn't know that somebody could be in such ecstasy and still actively tell the story of what is happening. Amazing. He didn't just leave us, and depart into his own little world in turning, but rather he went there and brought us back messages and played them out through the motions of his arms, body and head... unbelievable. The Mevlevi dervishes, along with a 12 musicians playing traditional Turkish instruments, were in Boulder for a public performance. 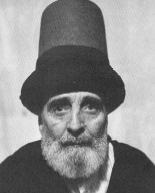 They were led by Sheikh Kabir Helminski. The first half of the performance was an introduction. Then after an intermission, the dervishes appeared. It was wonderful. Watching and feeling the interactions of the dervishes (semazens), the leader (semazenbashi) and the Sheikh was marvelous. 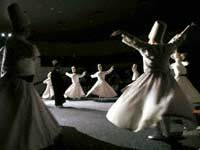 In every moment the dervishes were in continual movement, yet there was a calm, peaceful center that radiated from the dance into the audience. Wow. Another chapter in turning. Murshida Mariam Baker offered a full day workshop in Boulder in which we explored the feeling of turning in various ways and with different intent. The process was magnificent. We turned to the right, we turned to the left, we turned with different arm movements, we turned using different wazifas... we turned and turned and turned. It was wonderful. There were probably around 30 or 35 people attending the workshop. We were in ecstasy. And in the evening there were probably around 70 or 80 people at the Starhouse for dhikr. It was one of the best that I have experienced. There were several occasions that I wondered if we were ever going to go deeper, and suddenly realized that I was in a completely different part of the room than I thought I was in, with no idea of how I got to that part of the room. Those lines are so incredibly beautiful and inspirational to me. And they are also such an incredible challenge... the quiet, gentle inner voice urging us to awaken and walk in The Light while the petty ego insists that we wander off in our sleep to do that which brings neither lasting peace nor genuine fulfillment. 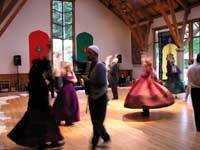 click here to go to my music page and then select "Don't Go Back to Sleep"
In June 2003, I had the delightful privilege of joining about thirty dervishes of the Mevlevi Order of America who gathered for a week of Sufi practices and turning on Whidbey Island, Washington. The week's practices culminated in a public performance of Mevlevi dhikr and sema at the Masonic Center in Seattle. The experiences of the week on Whidbey Island were marvelous indeed. If turning was just a theatrical performance, it would still be beautiful, but the real beauty of this practice is the illumination that occurs for everyone involved, including those who are watching as well as those who are turning. Each morning, as we practiced certain aspects of turning, Sheikh Jelaluddin Loras would walk around the room while we were turning, and would come near to us, one-by-one to offer comments, corrections and suggestions. Then in the afternoon we would continue to deepen our turning practice under the guidance of Mariam Baker and Suleyman Hofmann. At the beginning of one of the afternoon sessions, Mariam announced that Sheikh Jelaluddin had requested that we not stop turning when he comes around to talk to us. She said that almost everyone would stop turning as soon as Sheikh Jelaluddin began to speak to them with his suggestions... ahhhhh that was one of those epiphany moments. Gees....why would we stop turning to listen?? How foolish. We needed to just keep going and incorporate the suggestions... not stop and lose the opportunity of the moment. In that moment I saw how often it is that I stop what I'm doing in order to meditate and hear that still voice within... but what I really should be doing is always listening to that inner guidance, always listening to the calm voice that arises out of the stillness, and incorporating those suggestions in the moment, not as some sort of separate, isolated process called "meditation" or "listening". YES! Constantly listening to God... in every moment, in every situation.... constantly listening to God, staying centered in a place of peace and calm... that is exactly what this turning is all about. And perfectly dovetailing with that first "happening", the Divine Trickster was afoot and caused me to say something to Mariam about the phrase "oh Ram", and in response she recommended that I should read the autobiography of Papa Ramdas. Ohhhh what a delight this all is! al hamdulillah! All praise to God! Of the lessons that I have been privileged to receive, none has been greater or more useful than that of the great whirling dance. 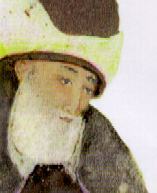 In whirling, the dervish must be constantly aware of where he/she is, what commands the Sheikh and/or dancemaster is giving, constantly aware of the movement of all of the other dervishes, what direction they are each going, where their arms are being held, how fast they are turning... all while spinning around at considerable speed, often while moving one's own arms and head in some choreographed manner. At first, such a combination of movement and awareness seems utterly impossible, as it's difficult enough to simply whirl without getting dizzy, let alone be aware of every little detail of the movement of other people too. But, gradually the teacher works with each of the dervishes and guides them to discover a still place within, and to revolve around that still point, dance around that still point, and radiate outward from that still point. Grounding ourselves..., we repeatedly reestablish the still point, the clean slate from which we can encounter ourselves and the world afresh. This all sounds like utter nonsense until one finally discovers that still place...and then the whole game changes. From that still place, everything is seen, almost in slow motion, with a calm and inner-knowing that is nothing less than miraculous. The doer disappears, and only the doing remains. If you are quiet and in a state of prayer when you Turn, offering everything of yourself to God, then when your body is spinning there is a completely still point in the center. So, even when there are ten or twenty or thirty dervishes doing the great whirling dance, there is one center that all are radiating from, and the entire dance radiates an utter calm, even in the presence of all this motion. And such is our challenge in everyday life, to stay centered in the place of peace, even in the midst of turmoil and activity. For those in the audience, the whirling experience can be captivating... the utter calm of that still point is directly experienced and many in the audience are mesmerized. They may not understand what has happened, but many in the audience will have a direct experience of the calm beauty out of which the motion and movement arise. That is to say, the audience is watching motion and movement, yet the loving calm and peace of that magnificent still point, the center of being, is the predominant experience. We do not Turn for ourselves. We turn around in the way we do so that the Light of God may descend upon the earth. As you act as a conduit in the Turn, the light comes through the right hand, and the left hand brings it into this world. ... We turn for God and for the world and it is the most beautiful thing you can imagine. And so it is that the great whirling dance has been a step toward learning to remain centered in the stillness, the inner calm, a place of perfect peace, which exists even in the presence of chaos, turmoil and change. In our everyday world, one often feels that profound peace can only be found in the complete lack of violence and hatred... but fortunately that is not true. In every moment there is a place of perfect inner peace that is completely independent of any outer turmoil. Peace is not merely the absence of hostility, but rather peace is an essential quality of being that arrives new and fresh in every moment... a quality that is all too often overlooked by anyone who is excessively focused on the outer turmoil. When one discovers that still point, and lives a life centered on that still point, the world is transformed; diversity is overshadowed by Unity, and the qualities of Love, Harmony and Beauty everywhere abound in a stillness where there is only the doing... the doer has vanished.